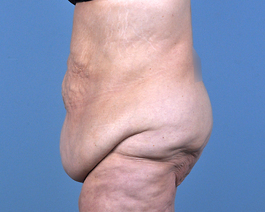 This 46-year-old mother from Virginia Beach had lost 50 pounds when she came to consult with me because she was bothered by muscle laxity and hanging skin. 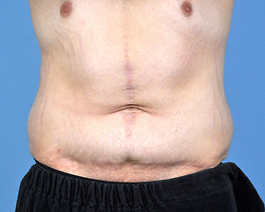 I discussed with her that a tummy tuck would give her a very good result but with a scar trade-off. 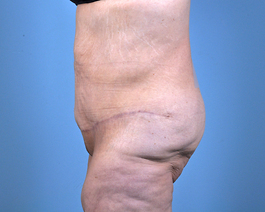 It is always our goal in surgery to create the best scar possible and have it concealed. Her long lower scar was designed around her bathing suit bottom she brought the day of surgery. As with all of our abdominoplasty patients, extra time was spent to pull the belly button scar part or all the way into the umbilicus. Without this extra 20 or 30 minutes in surgery, the scar around the umbilicus will sit at the surface, looking very obvious, like a bull’s eye or ring around the belly button. Pulling the scar into the umbilicus does create some depth but it is still very natural appearing. 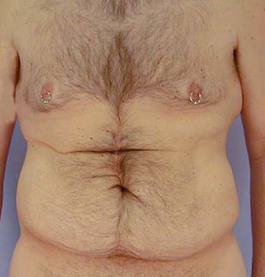 Unfortunately, routine abdominoplasty pictures have two large flashes coming from the sides that create shadow inside the umbilicus. For the close up view of her belly button, a light from the front was shown over the area creating a more natural ambient light appearance. This is what is normally seen outside of a photo studio. Notice very little of the scar is showing on the outside. I cannot always hide all of the umbilical scar on the inside but usually a considerable amount and I think it is truly worth the extra time and effort to give my patients the best possible scar.